Howard attended Canterbury Boys High School in Sydney, and after graduating in Law from the University of Sydney in 1961, he pursued a career as a solicitor. Keenly interested in politics, Howard had joined the Liberal Party at the age of 18, and, five years later, was President of the Young Liberals. He was elected to federal parliament in 1974, winning the Sydney seat of Bennelong. A year later, Prime Minister Fraser appointed him Minister for Business and Consumer Affairs. In 1977, aged 38, Howard became Treasurer. Fraser’s government was defeated in the 1983 election by the Australian Labor Party led by Bob Hawke. Fraser resigned and Howard unsuccessfully contested the Liberal leadership against Andrew Peacock. Howard continued to have leadership aspirations and, in 1985, he became leader of the Liberal Party and Opposition Leader. Howard lost the 1987 election, and his leadership was challenged in 1989 by Peacock, who, this time, secured the right to lead the Liberal Party. After his defeat in the 1989 leadership ballot, Howard served in the Shadow Cabinet under three successive Liberal Opposition Leaders – Andrew Peacock, John Hewson and Alexander Downer – biding his time as the Liberal/National Party coalition lost the 1990 and 1993 elections. In 1995, after two years of Liberal leadership instability, John Howard succeeded Alexander Downer as leader. In March 1996, Howard won a sweeping election victory against Paul Keating’s Labor Government and became Australia’s 25th Prime Minister. Under John Howard’s leadership Australia strongly supported the United States and other nations in the fight against terrorism. Australia contributed military forces to operations in both Iraq and Afghanistan. Australia also led the United Nations sanctioned Interfet force following East Timor’s vote for independence. 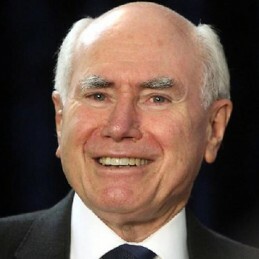 Howard had faced stern tests of his leadership during his period as prime minister, such as the Port Arthur shootings in Tasmania, the East Timor crisis in 1999, the Tampa asylum seeker controversy, the terrorist attacks on New York and Washington, and the Iraq War. In his government’s responses to these crises Howard set the tone of his prime ministership, which was one of decisive leadership in testing times, even in the face of opposition.